ST. JOHN’S, NL – The membership of the Newfoundland and Labrador Environmental Industry Association (NEIA) has been expanding at a rapid rate, but the organization feels there is substantial opportunity for growth. NEIA is focused on economic development and the growth of the sector. A report commissioned by the provincial government in 2011 suggests that the green economy has the potential to add over 3,000 jobs by the year 2020. NEIA’s projects, activities and collaborations aim to achieve this growth. “NEIA aggressively supports the growth of firms within the sector, providing and facilitating important programs for new and growing businesses,” says Lomond. NEIA offers supports for innovation and commercialization, facilitates international business and export development, and works with its members to enhance productivity and competitiveness. 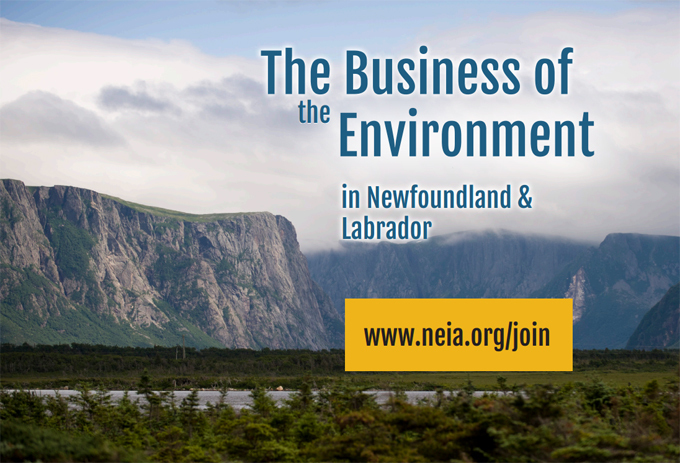 NEIA membership is a commitment to the protection of Newfoundland and Labrador’s environment, and an interest in the growth of the province’s green economy and environmental sector capabilities. Interested businesses in NEIA membership can visit www.neia.org/join for more information. NEIA is The Business of the Environment, and has over 170 members.